Dr. John Molnar, superintendent of Southmoreland School District since 2011, has been extremely supportive of the Scottie Band during his tenure at Southmoreland. He was awarded as the “Pennsylvania Music Educators Association’s Outstanding Superintendent” in April 2017 and participated in the Southmoreland Alumni Band Concert, playing the trombone. The piece was kept a secret from Molnar in order to surprise him as one last expression of gratitude before his retirement. Mrs. Gore then introduced Dr. Molnar’s wife, Mrs. Susan Molnar, on stage to play piano for the piece. 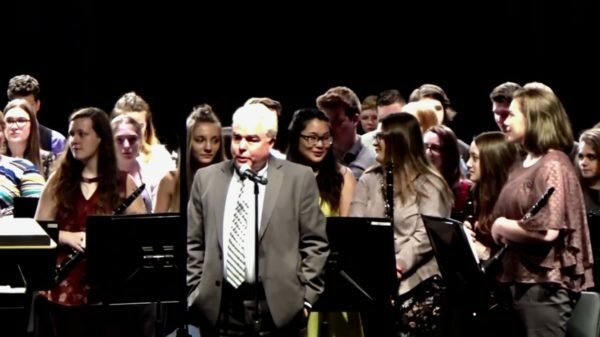 Once the song was over, Dr. Molnar walked on stage to show his appreciation for the piece.